Silkweed is another valuable herb to farm, it’s not as abundant as some other herbs (Rain Poppy & Green Tea Leaf) but it can be farmed effectively if you know where to look. It’s used by alchemists to make the Flask of the Warm Sun (+int). It will also sell to scribes who are looking to mill herbs to gather pigments. Silkweed sells best in stacks of 20, and you’ll want to be at least level 86 to farm it and have level 545 herbalism. Silkweed is also a great herb to farm along with Golden Lotus, since they share spawning locations if you gather a lot of Silkweed you’re like to find a little bit of Golden Lotus. Update: You can make a lot of gold with Silkweed, but if you want to step it up and make thousands of gold you should read my personal favorite guide. 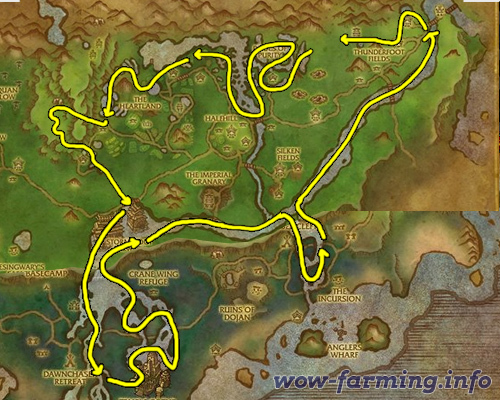 Silkweed is found throughout Pandaria around inland water sources. However, it seems to be most abundant in Valley of the Four Winds.